Have you ever discovered a great article, picture, or download on a website, only to forget where it was later on? Here’s how you can use Evernote to keep up with interesting stuff on the web with the new Evernote extension for Chrome. Evernote is a great notetaking tool that can help you remember everything. 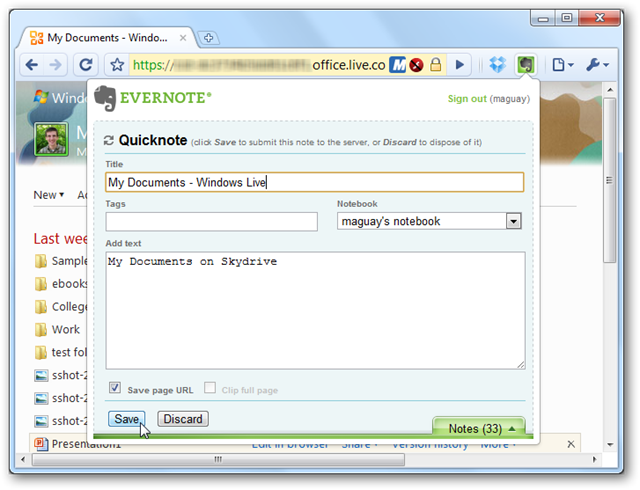 It works on Windows and Mac, as a variety of mobile platforms, and on any browser with their Evernote webapp. 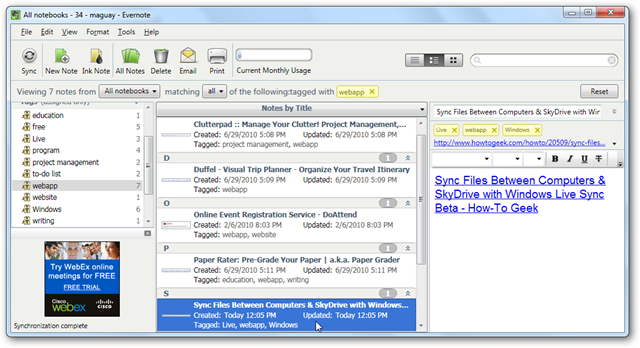 You can jot down notes or upload images and files, and then quickly search and find it later. Evernote has made browser plugins for years that make it easy to clip web content into your Evernote account, but the latest version of the Chrome extension takes it further. 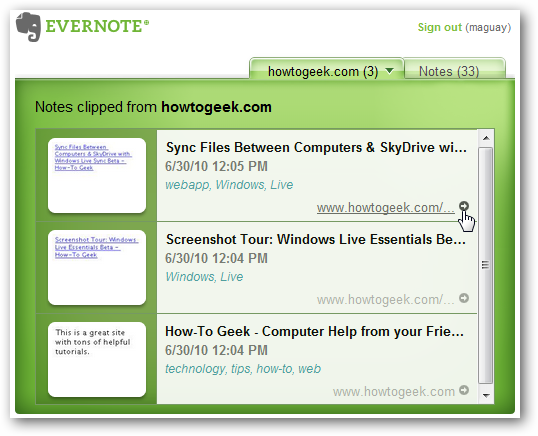 It lets you quickly find all clips from the site you’re on, and open clipped sites without opening the Evernote webapp. Let’s look at how it can help you keep up with everything you find online. If you don’t already have the Evernote extension installed in Chrome, head over to the link listed below and install as normal. If you were already using the Evernote extension, you may already have the updated version installed; if you do not see the new features, restart Chrome and the extension should be updated. You should now see the Evernote logo in your Chrome toolbar. 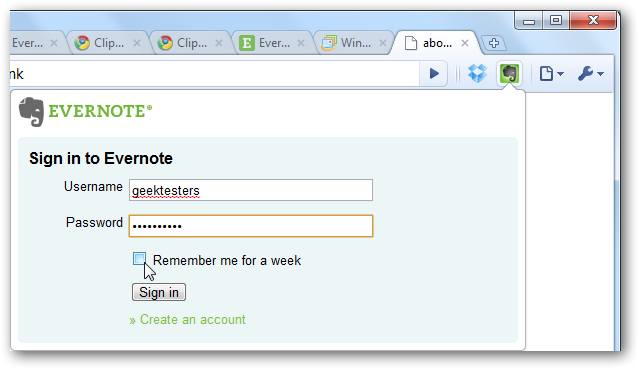 Click the icon, and login with your Evernote account. If you don’t want to have to re-enter your password every time you use the Evernote extension, check the Remember me for a week box. Now, when you’re visiting a site you want to remember, click the Evernote logo. This will open a mini editor where you can add more info about the site, or simply click Save at the bottom of the page to quickly remember it. If you want to make sure you know exactly why you saved this site and be able to find it later easily, it’s often good to include more information about the site. You can add tags to the note, include your own notes about the site, and choose to clip the full page. This final option lets you capture the full page, so you can read it later directly in Evernote on any device. 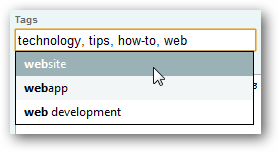 Tags are especially easy to add to a note, as Evernote will show your recently used tags in an Intellisense-like popup. Select the one you want and save a few seconds of typing. 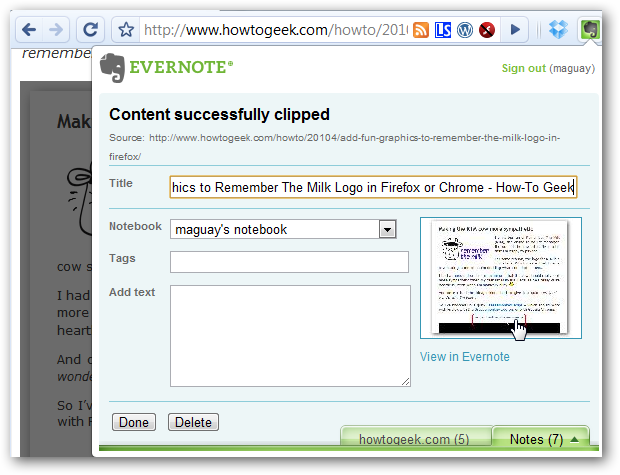 If you want to clip a particular part of a page, select it as normal, and then click the Evernote Extension. You’ll see a small preview on the right of the content you selected, and then can still add tags and text as normal. You can even clip pages from secure, password protected sites, such as your Office Live or Google Docs account. 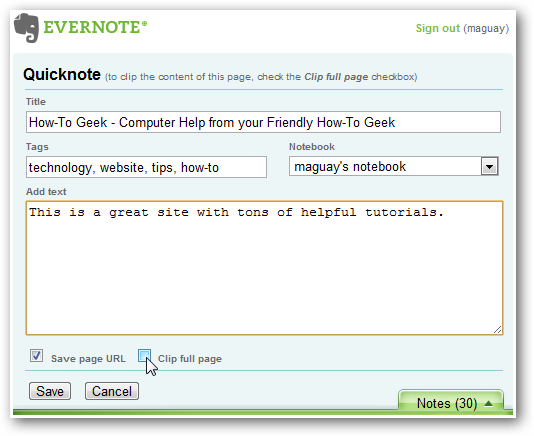 Once you’ve added a note from a website, you can easily those notes when visiting that page. 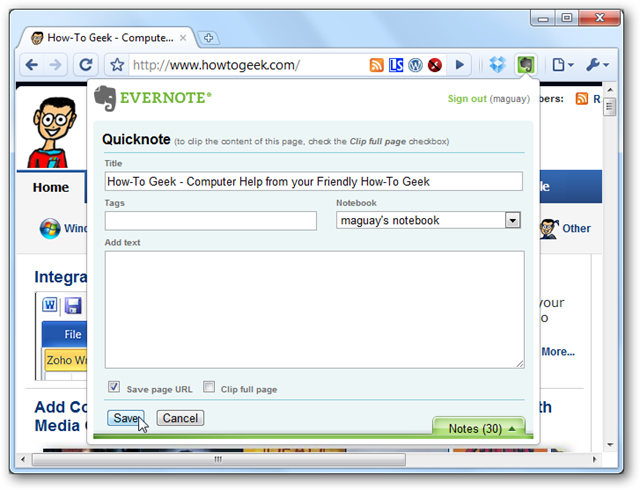 We have saved notes on 3 How-to Geek pages, so when we went to make a note on a new article, a new howtogeek.com tab appeared at the bottom of the Evernote Extension. Click this tab to see all of your notes from that site. Click the note image on the left to open it in the Evernote webapp, or click the link on the bottom right to directly visit the page you’d noted. If you have clipped secure content, such as something from a document in your Google Docs account, you may have to login to that service to access the site, but the address saved will go directly to your content once you’ve signed in. Or, from any site, you can access all of your notes from the Notes tab. 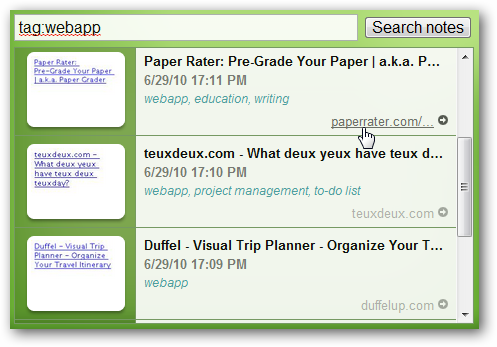 Enter a term in the search field to view all notes with that term or tag. You can search for anything, but as you’re typing, you’ll be able to choose similar tags quickly. This is the best way to find the note you’re looking for. Note that we’re doing all of this from the extension without going to any other page. Since you can simply click the link at the bottom of the note to visit the site, this makes it an excellent bookmark tool. 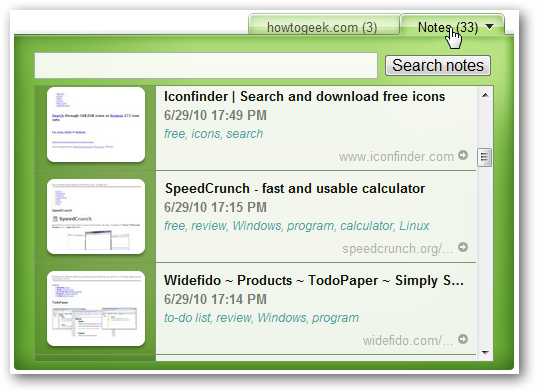 You can view and search all of your notes this way, no matter if you made them on your computer, mobile device, or with the Chrome extension. You can also access your web clips from any Evernote program, including the desktop program for Windows or OS X, or the mobile apps for iOS, Android, Windows Mobile, and more. Whether you’re trying to keep up with all of your favorite pages on a site, or want to make sure you don’t forget a great article you read, the Evernote extension for Chrome lets you remember everything easier than ever. We’ve actually started using it instead of bookmarking sites, since we can add additional information and search for old sites directly in Chrome. You can access you notes from a wide range of devices, so it’s great to save sites and then later view them on your mobile device.